The MH Posts Horizontal widget which is included in MH Magazine has been developed to display a horizontal grid of posts including thumbnails. This flexible custom widget can be placed in any of the available widget areas and the layout adapts based on the width of the particular widget area. Using the MH Posts Horizontal widget you can display large or small grids and present posts nicely. This support article including video tutorial will help you use the MH Posts Horizontal widget correctly. You’ll learn how to display a grid of posts when placing the widget into the according widget area or how to display multi-row grids with several thumbnails based on your preferences. 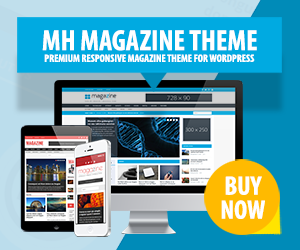 The MH Posts Horizontal widget in general is suitable for all widget areas, full-width, 2/3 and 1/3 width. The layout of the widget always adapts based on the widget area it is being placed in and according to the number of posts you want to display. To control the widget content, you can enter the widget title and select your preferred category from the drop-down menu. To display posts from multiple categories, you can enter additional category IDs to your already selected category. As an alternative you can filter posts by tags – simply enter the preferred tag slugs into the provided field, separated by commas. While making use of the MH Posts Horizontal widget, you can display a grid of one or multiple rows of posts. The widget layout adapts based on the number of posts and the width of the particular widget area. After you’ve adjusted the settings for the widget, please save your changes accordingly and see the results on your website. You can have a look at the video tutorial where you can see some examples of how the MH Posts Horizontal widget could be used on your website. In the examples we’ve placed the widget into full-width, 2/3 and 1/3 width widget areas so that you can see how the layout of the widget automatically adapts based on the available width. You can replicate the examples on your website or feel free to place the widget differently on your WordPress website as you like.